There are no any limitations on what you can place inside the popup window. You can insert any custom HTML (text, image, div container, etc) or other DHTMLX components, such as Accordion, Calendar, Form, Grid, Layout, Tabbar, or Tree. dhtmlxPopup comes with three predefined skins you can choose from. The Form, Toolbar, and Ribbon components support native integration with dhtmlxPopup. The popup can be easily attached to dhtmlxToolbar/dhtmlxRibbon button or any element (input field, button) of dhtmlxForm. dhtmlxPopup is included in the dhtmlxSuite package but also can be used as an individual UI component for displaying custom HTML content in an attractive popup box. dhtmlxPopup is available in the Standard Edition only and can be downloaded as a part of dhtmlxSuite. You can use dhtmlxPopup for free under GNU General Public License v2 or Free License that allows you to use the component in a non-GPL application. Open Source - GPL v2 - Allows the use of dhtmlxPopup in open source, GPL-ed projects for free. Free License - Allows you to use dhtmlxPopup in non-GPL, commercial projects/applications at no charge. 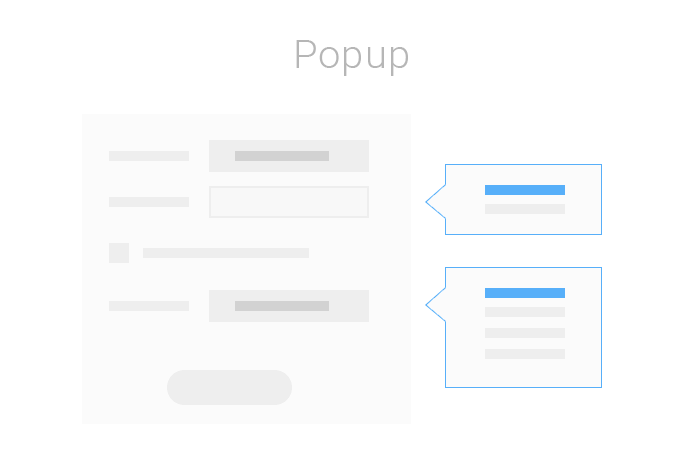 Our detailed documentation can learn how to use Popup and effectively implement it in your own applications. It provides the detailed information regarding each aspect of the widget.